Daniel’s parents are unauthorized immigrants who came to the United States as young children. For the past several years, Daniel has been living in Texas with his mother, Carmen, while his father, Miguel, has been working in California.1 Both Miguel and Carmen are part of the Deferred Action for Childhood Arrivals (DACA) program instituted by the Obama administration in 2012, which allowed them each to get a work permit and a temporary reprieve from deportation.2 Since the election, President Donald Trump has indicated that the future of DACA is unclear, fueling heightened concern and fear among DACA recipients.3 That uncertainty has reached new heights in recent weeks, as attorneys general from several states have threatened to sue the administration to end DACA if the program is not terminated by September 5, 2017.4 While Miguel had initially planned to join his family in Texas this past January, after the election, he put his plan on hold as he faces greater uncertainty about whether he will remain protected under his DACA status. Miguel’s biggest concern is how living under an administration that is openly targeting the unauthorized immigrant community could affect his son. With the uptick in immigration arrests, immigrant parents must consider deportation as a serious possibility. Across the country, parents have been creating contingency plans that establish what will happen to their children if they are deported, granting power of attorney to a relative or trusted friend and telling children what may happen in the parent’s absence.12 Even DACA recipients such as Miguel—who are work-authorized—are fearful enough to create these contingency plans. Miguel and Carmen decided that in the case of their deportation, Daniel would stay in the United States with his grandparents, who are now U.S. citizens, to maintain stability in his life. Like many parents, Miguel says that Daniel can sense when there is a shift in Miguel’s mood and emotions. As the threat of deportation for immigrant parents intensifies, they must cope with their own fear and stress while supporting their children. In addition to financial and emotional burdens, constant worry about being arrested or deported weighs on parents. The consequences of parental stress for young children can start even before birth. One well-documented instance of spillover from mother to child, and to the greater Latino community, was observed following one of the largest immigration raids in U.S. history. The 2008 immigration raid of a factory in Postville, Iowa, led to the detainment of 389 mostly Latino workers: Word of the raid spread quickly and triggered fear among Latino communities across the state.25 In the nine months following the raid, babies born to Latina mothers in the state of Iowa—U.S. citizens and unauthorized immigrants alike—were 25 percent more likely to have low birth weight compared with the previous year, a result of maternal and fetal stress.26 There was no change in birth outcomes for non-Latina white mothers. Young children and adults alike are largely a product of their environment, and instilling a sense of fear and uncertainty into an entire community affects both citizens and immigrants. Early childhood is a critical stage in development when children need access to basic living standards—such as quality health care, nutritious food, and education—in order to thrive. Without these critical services, children can endure lifelong consequences. Specific programs target young children to help meet their needs, including Medicaid; the Special Supplemental Nutrition Program for Women, Infants, and Children (WIC); and Head Start. As a country, investing in these programs makes sense to help mitigate hardship in the short term and because they have been shown to pay off in the long run. Children in unauthorized communities are historically underenrolled in important public programs to begin with, due to language barriers, lack of information, and their parents’ or guardians’ fear of interacting with public systems.27 On top of these barriers, increased local immigration enforcement and a leaked draft executive order suggesting that immigrants could be deported for using public assistance has made immigrant parents even more afraid of getting their children the services they need.28 While the services provided by these programs can help mitigate the detrimental effects of toxic stress on young children, not having healthy food or proper medical care can exacerbate the impact. Now more than ever, access to important programs is critical for keeping children’s healthy development on track. President Trump’s policies and rhetoric contribute to a toxic environment of fear that may alter the developmental outcomes of millions of children. While this generation has the potential to grow up and help the economy thrive, Trump’s immigration policies could leave that economic power untapped. Trump’s anti-immigrant agenda compromises the economic security of immigrant families with children, which can negatively affect child outcomes. Separating families and deporting the primary breadwinner from a household can throw immigrant families into deep emotional and economic turmoil: Removing unauthorized residents from mixed-status households—those with both authorized and unauthorized members—could reduce the median annual household income by almost 75 percent, from $33,000 to $9,000.32 For many children, this could mean going without the nutritious food, consistent housing, or medical services that are critical for their healthy development. While Trump argues that deporting unauthorized immigrants benefits the economy, research says otherwise. 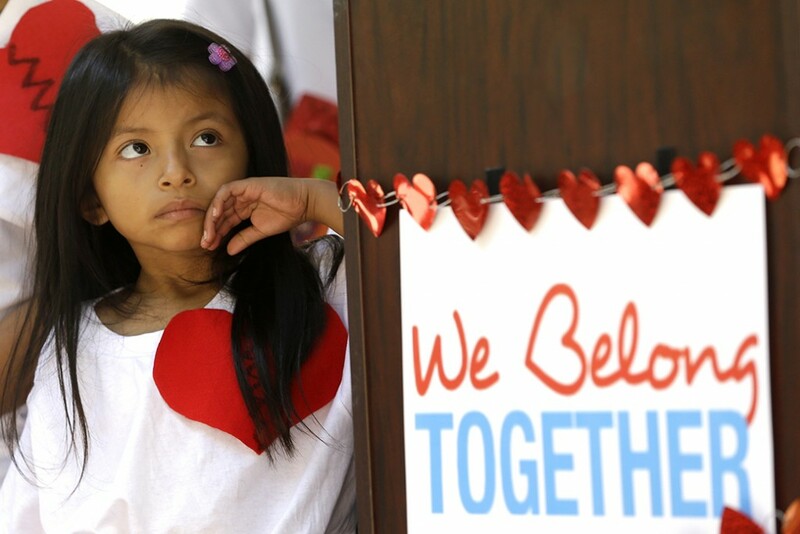 In states that ramped up their immigration enforcement efforts, low-income immigrant households with children experienced increased material hardship—such as difficulties paying for basic expenses, utilities, and medical care—while U.S.-citizen households saw no economic loss or gain.33 When taken to scale, this could imply that Trump’s mass deportation agenda will drive citizen children of immigrants into poverty—and increase stress and psychological trauma—without accomplishing his goal of improving conditions for nonimmigrant citizens. Together, the consequences of toxic stress and economic insecurity on young children could severely affect the nation’s future workforce. Children who face adversity during early childhood—such as trauma, separation from a parent, or deep poverty—are more likely to have poor health, drop out of high school, be unemployed, and live in poverty in adulthood.34 These outcomes can lower job prospects and inhibit people’s ability to reach their full potential in the workforce, representing a lost opportunity for the economy. The fear and anxiety that children are feeling because of President Trump’s immigration policies will not fade when a new administration takes over; the experiences that this generation of children has now will continue to affect them for the rest of their lives. It is critical for the administration to consider carefully the true expense of a mass deportation agenda. In the meantime, it is everyone’s duty to foster an environment of support for all children, regardless of their family’s immigration status. Children such as Daniel—and our economy—depend on it. Leila Schochet is a research associate for the Early Childhood Policy team at the Center for American Progress.